Ultra Edge XL is one of the newest supplements available which may help you gain lean muscle mass and amplify your workouts. A combination of branched chain amino acids (BCAAs) and Chinese herbs are believed to help your muscles grow bigger and faster than just a plain old workout. Ultra Edge XL may help boost energy to take your gym routine to the next level. Ultra Edge XL is one of the newest weight training enhancement supplements. Branched chain amino acids, certain molecules, and Chinese herbs are all a part of the Ultra Edge XL formula. Ultra Edge XL contains ingredients that people with high energy levels claim to enjoy. Ultra Edge XL is different from other workout supplements because it contains ingredients that most other supplements don't have. It also leaves out certain useless ingredients which other supplements like to add to their formulas. The vast majority of the ingredients in the Ultra Edge XL formula are BCAAs. The human body needs branched chain amino acids. These amino acids are essential for muscle growth and healthy biological function. The best way to take Ultra Edge XL is to take one (1) capsule twice daily. For maximum results, ingest the first capsule about 30 minutes before your workout. This should promote increased energy and endurance. Then take the second capsule within 30 minutes of the end of your workout. This is intended to keep your muscles fueled with the nutrients they need to repair and grow stronger. Like many BCAAs, Isoleucine is used by your body to help biologically synthesize proteins. This biological synthesis is necessary for optimal health. It is sometimes useful when you are trying to rebuild lost muscle mass or improve your current musculature. The thing that makes Ornithine slightly different from other amino acids is the fact that it is considered a non proteinogenic amino acid. But that doesn't mean it can't play a role in basic biological functions. As a matter of fact, it is a part of the urea cycle. Sometimes, when the body processes amino acids, urea is created in the process. But Ornithine is also created in that same process. When Ornithine is exposed to urea, it helps take the urea to the kidneys where it can be excreted by the body. Too much urea in your system may cause unpleasant health issues. Valine is a non-polar aliphatic amino acid. Getting this amino acid into your body has to come from your diet, because your body cannot produce it on its own. The same is true for Lysine as well. Meats, soy, dairy, beans, and legumes all contain healthy amounts of both of these amino acids. Although Glutamine is scientifically classified as a polar amino acid, it is also considered charge neutral. This makes it different from glutamic acid because it has a side chain amide, essentially replacing a carboxylic acid molecular group which would normally be a part of a glutamic molecule. Glycine differs from other amino acids in that it only has one hydrogen atom attached as a side chain. Glycine is the base of all other amino acids, because it has the simplest molecular structure. Yet, it is a very important amino acid. The basis for genetic sequences are constructed with Glycine. Insufficient amounts of glycine in your diet can result in DNA damage, which will eventually lead to premature aging. Arginine is considered a charged aliphatic amino acid. Biological protein synthesis uses the amino acid Arginine in more biological processes than almost any other amino acid. This is especially true when it comes to blood vessel dilation. When the body needs to dilate its blood vessels as a reaction to external stimuli, Arginine is used to synthesize a chemical called nitric oxide. This molecule usually makes blood vessels dilate and increases blood flow. Panax ginseng is a perennial plant native to Eastern Asian mountain regions. It is especially common in Manchuria, Siberia, Japan, and the Korean peninsula. Russia and China actually protect the Panax ginseng plant to prevent it from going extinct at the hands of over-cultivation. With any diet and exercise program, micronutrient deficiencies can be an unfortunate consequence of cutting calories. But most people believe that you cannot lose weight unless you consume fewer calories than you normally would. Anything that can help your body absorb micronutrients is preferable to losing essential vitamins and minerals to malabsorption. Lifting weights is great for muscle building. Humans need muscle tissue to survive. It helps us move around, and it is essential for preventing injurious falls (especially as people get older). The more muscle you have, the healthier your body will be. Therefore, building more muscle is a good way to help improve your overall wellness. If you want that extra edge to help you meet your goals, a natural workout supplement like Ultra Edge XL might help you blast through your peak and get the gains you've been looking for. It might give you the power to endure the hardest workouts and perform at your absolute max. Fatigue is also a concern for most people. An insufficient dietary intake of branched chain amino acids could potentially be responsible for this fatigue. Fatigue makes it hard to concentrate, remember things, perform well on the job, and enjoy everyday activities. Changing your diet in order to eliminate fatigue, even if you have to use supplements, might improve your health. Ultra Edge XL contains several amino acids. Whether you are a veteran of the gym, or you are just starting a workout program, Ultra Edge XL might help you achieve a level of performance you never thought possible. 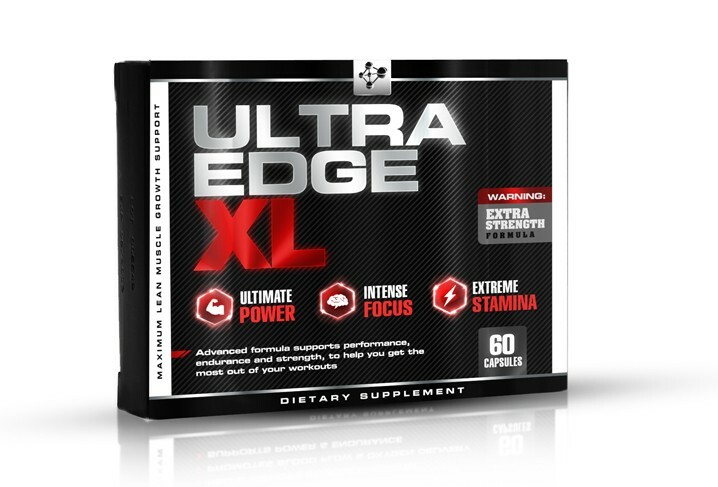 Ultra Edge XL may help you blast through frustrating plateaus and see a new level of gains that you never thought were possible, or give yourself a jump-start on a new fitness regimen.